The end of the year is a natural time to look back on 2018's most defining moments, the highs and the lows, the pictures and the stories which best capture the significant developments, movements, or trends. Reuters' "Pictures of the Year 2018" feature, released last month, is a case in point. With 100 images capturing poignant highlights including natural and environmental disasters, diplomatic breakthroughs, the tribulations of migrants and refugees, international conflicts, cultural and athletic feats, and political turning points, along with scenes of incredible beauty and untold suffering, the news agency aims to convey the human experience of 2018. And, among these scenes of triumphs and failures, epic and mundane, Reuters unintentionally included one more: the pervasive anti-Israel media bias which plagues much of the news coverage of Israel and its relations with its neighbors. Thus, one of the selected Reuters images was apparently intended to convey the Israeli-Palestinian clashes at the Gaza border since Hamas began the violent "March of Return" events in late March. In reality, it exemplified the flawed, caustic media coverage skewed against Israel. Before Reuters was compelled to correct it, the caption originally stated: "A relative mourns as she carries the body of 8-month-old Palestinian infant Laila al-Ghandour, who died after inhaling tear gas during a protest against the US embassy move to Jerusalem at the Israel-Gaza border, during her funeral in Gaza City, May 15." Yet some six months had passed since it was reported that even Hamas' Health Ministry walked back its accusation of Israeli responsibility after it was revealed that the infant suffered from a preexisting heart condition that tragically killed her. Indeed, that Reuters selected the image, and even included the misinformation that was long ago debunked, is symptomatic of a year marked by media malpractice with respect to Israel. Thus, in the seasonal spirit, we embark on a trip down memory lane of the most egregious media misdeeds, which both exaggerate Israel's ostensible belligerence and, even more commonly, diminish her opponents' aggressions. 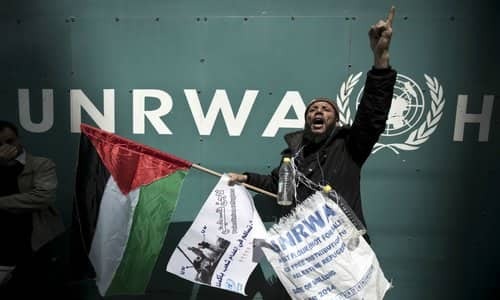 Unforgettably, in April, The New York Times published what Dani Dayan, Israel's consul general in New York, called "the correction of the year," after the "Paper of Record" falsely labelled reports that the Palestinian Authority pays terrorists and their families to the tune of hundreds of thousands of dollars a "far-right conspiracy theory." Since then, any one of several media misdeeds could qualify as "correction of the year." The Agence France Presse alone offered up two contenders. In October, a brave Israeli mother saved herself and her children by running in the middle of the night to their safe room seconds before a Palestinian rocket fired from the Gaza Strip slammed into their home. About the home's destruction, the news agency reported that the rocket "caused damage to the garden of the family home." After the intervention of media watchdog CAMERA, subsequent AFP coverage noted that the rocket "caused major damage" to the home and reported the family's perilous flight. The next month, as Gaza's terror groups rained down 460 rockets and mortars on Israeli cities, towns, and villages across the south, and Israel struck back at 160 Hamas and Islamic Jihad positions, AFP published a graphic in English, French, Arabic, and Spanish purporting to show the locations of attacks on both sides. In Israel, it indicated that just two places were hit. Thanks to the work of Paris-based InfoEquitable together with CAMERA, AFP corrected the report. Then, during the same round of violence, CBSN, CBS's online 24/7 news service, falsely reported that "Palestinians have fired hundreds of rockets at Israel's military," as opposed to the scores of civilian communities that were targeted. Then later there was the correction: "In fact, the rockets were fired into Israel including several cities and civilian targets." In October, a CNN headline falsely reported: "Seven Palestinians shot and killed by Israeli forces in Gaza during violent weekly protests." In fact, several of those killed had blown a hole in the border fence, crossed into Israel, and were approaching soldiers when they were killed in Israel, not Gaza. In response to CAMERA's complaint, CNN corrected. But not all corrections set the record straight. On the Iranian front, the Associated Press reported in November that "Iran has never threatened to attack Israel," despite the fact that Iran has called for Israel's annihilation on countless occasions. A subsequent AP "clarification" characterized Iran's "death to Israel" calls as a matter of Israeli perception, stating: "Iran frequently condemns Israel and predicts its demise. The story should have made clear that Israeli officials view any such comments as existential threats." Yet just days earlier the same news agency had no difficulty identifying an Israeli minister's statements about a Hamas leader's limited time on this earth as a threat. In one case, a Newsweek "correction" introduced false information, stating: "This story has been updated to remove information that includes an error that says no Palestinian state has ever existed." It is a historical fact that there has never been a Palestinian state. Journalists who fail to uphold their professional standards of practice were a fixture polluting our media landscape, skewing even the year-end record meant to capture 2018.